“The uranium hexafluoride (UF6) containers in your photos are of the type 48Y which is designated as a Type B cask that is required to sustain immersion in a fire of 800°C for 30 minutes – this test condition is not that particularly onerous, neither in temperature nor duration of the immersing fire.” John Large (in an email to Radiation Free Lakeland). 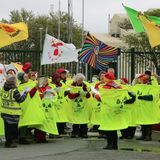 About the author Lowana Veal is a biologist and freelance journalist who has been involved in the anti-nuclear movement since the mid 1970s. She wrote Wildlife and the Atom for Greenpeace (London) in 1983. She now lives in Iceland, where there are no nuclear power stations.
! October 1984, Uranium hexafluoride (UF6) at URENCO in the Netherlands (Bogaerts, Rob / Fotocollectie Anefo) 1. The basics Capenhurst is a uranium enrichment site in Cheshire, owned and operated by URENCO, and consists of three enrichment plants – E22, E23 and A3 – though most comes from E23. Sister plants are found in the Netherlands and Germany, in Almelo and Gronau respectively, as well as in New Mexico in the USA. Most of this leaflet will focus on the UK arm. Located just ten kilometres (seven miles) north of Chester and less than six km (four miles) southwest from Ellesmere Port, URENCO’s Capenhurst site spans 110 hectares (270 acres). Wales is a mere four km (2.5 miles) to the west while Liverpool is 15 km (10 miles) north of the plant. Ellesmere Port and Liverpool are two of the ports that URENCO uses for exporting uranium from the plant. South of Liverpool, Eastham Dock in the Wirral has been used occasionally for large shipments. 2. History of the plant The Capenhurst site had originally been developed as a Royal Ordnance factory during World War II. After the war, a uranium enrichment facility which used diffusion technology was set up there, but in 1993 it was divided into two sites, one for the diffusion plant and the other for the enrichment plant. 4. Uranium enrichment and the nuclear cycle Several forms of uranium exist, but most uranium ore deposits are uraninite, which used to be called pitchblende. Once mined, the ore is milled to produce yellow granules, called yellowcake or urania. This has the formula U3O8 and is usually called uranium oxide, though it is also known as triuranium octaoxide, as its formula dictates (tri- for three and octa- for eight). uranium and heavy metal compounds, it is toxic to the kidneys when ingested or inhaled in large quantities. When released to the atmosphere, the combination of UO2F2 and HF (hydrogen fluoride) produces a white cloud that can be so dense it obscures vision. From samples taken between 1979 and 1989, the British Geological Society reported levels of uranium three times higher than normal background levels in stream sediments near Capenhurst. 5. Transport of HEX Enriched uranium is sent from Capenhurst in standard 30B cylinders that typically weigh 2.27 tonnes (5,020 lb) and are approximately 75 cm (30’’) in diameter. Natural uranium (UF6 before it is enriched) and residues of UF6 (called heels) are transported in 48Y cylinders, which are considerably larger than 30Y cylinders and can accommodate 12.5 tonnes (27,560 lb) of uranium. Heels are highly radioactive residues of enriched UF6 that are left in cylinders after unloading of UF6. They too are “The uranium transported in 30B cylinders. hexafluoride (UF6) containers in your photos are of the type 48Y which is designated as a Type B cask that is required to sustain immersion in a fire of 800°C for 30 minutes— this test condition is not that particularly onerous, neither in temperature nor duration of the immersing fire.” John Large in an email to Radiation Free Lakeland. Besides the depleted HEX that is stored in the 0236 legacy containers, depleted HEX has also accumulated in 48Y cylinders â&#x20AC;&#x201C; and will continue to do so during the 25-year lifespan of the Tails Management Facility (TMF). As stated earlier, depleted HEX will be deconverted to remove the extra fluorine molecules from uranium hexafluoride to make uranium oxide, U3O8, and hydrogen fluoride (hydrofluoric acid) which will be sold off. However, this process is not 100% effective, so that tails may also contain trace quantities of HF and UF2O2, uranyl fluoride. The TMF is supposed to be fully operational by 2020, although the date has been postponed many times, and will continue until at least 2053. It will consist of a tails deconversion plant (TDP); a UF6 cylinder handling and storage facility (CHF); a UF6 cylinder wash facility (CWF); a decontamination and maintenance facility (DMF); a residues recovery facility (RRF), an effluent treatment plant (ETP) and a uranium oxide (U3O8) store (UOS). The uranium oxide will be received and dispatched in DV70 containers. Some of these will eventually be dispatched to URENCOâ&#x20AC;&#x2122;s plants at Gronau and Almelo. The DV70 containers, which are made of steel, have a volume of approximately 3-4 m3, typically hold 10 tonnes of uranium oxide, U3O8, and will be stored for up to 100 years. They will eventually be transferred to a national repository for final disposal, though this will not happen before 2120. URENCO have stated that they will process some 3,000 tonnes of depleted HEX a year, and also that the deconversion process will not be completed until 2053. URENCO has agreed a tails storage limit of 70,000 tonnes with the regulator, the Office for Nuclear Regulation (ONR). Presumably these calculations do not include the tails that will be produced in the meantime. Note that it is assumed that URENCO will stop enriching uranium in 2035, although this document14 stems from 2004 and URENCO may have changed their minds since then. 7. Storage of submarine reactors In 2016, it was announced that Capenhurst would be the site for the MOD’s Submarine Dismantling Project (SDP). 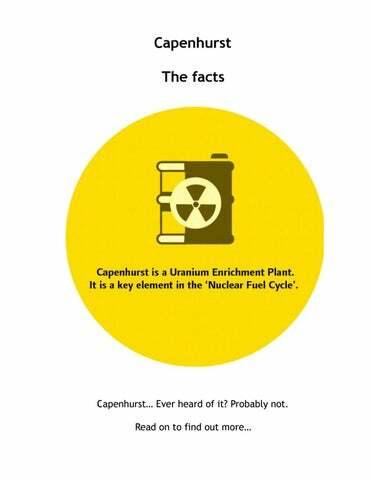 A few years prior to the announcement, the MOD produced a factsheet15 detailing the advantages of Capenhurst as a location for the project, which involves interim storage of intermediate-level radioactive waste, as opposed to the other shortlisted sites (Aldermaston, Burghfield, Sellafield and Chapelcross). Four processes are involved, according to the factsheet. First, the reactor pressure vessel (RPV) is removed from the submarine and placed in a “secure container” for transport. The RPV and container are then transported to the storage site by road, where they are stored until a geological disposal facility (GDF) becomes available, sometime after 2040. The RPVs are repackaged and sent for size reduction. The different types of radioactive waste arising are sent for disposal. One “advantage” of Capenhurst is that a detailed decommissioning strategy is already in place which includes the progressive refurbishment, decommissioning and demolition of a range of nuclear facilities as well as the appropriate treatment and disposal of wastes. The Strategic Environmental Assessment reports that minor changes may be made to local roads. Capenhurst Nuclear Services (renamed URENCO Nuclear Stewardship after the decision was made to house the SDP at Capenhurst) said that the RPVs would be transported via the A51 and “through the village, thereby avoiding the Capenhurst bridge”. Moreover, “(T)here may be up to three RPV transports in the first year. Based on initial dismantling of the submarines at Rosyth and then those at Devonport, the long-term rate is expected to be around one a year thereafter. If there were some parallel work at Devonport and Rosyth, it could be around two a year for a few years.” RPVs from 27 nuclear submarines will be stored at Capenhurst.